Laser cooling is a very elegant and versatile technique, as it permits to cool atoms, molecules, ions, and even mechanical objects from room temperature down to temperatures as low as one millionth of a degree above absolute zero [1,2]. At these low temperatures, we can enter into the world of quantum mechanics. One of the fascinating phenomena associated with this ultracold regime is the appearance of quantum degeneracy in atomic gases . Since the early days of laser cooling, the question has been asked if the quantum degenerate regime could be reached using laser cooling as the only cooling process. Despite significant experimental and theoretical effort to overcome the limitations of laser cooling this goal has been elusive. November 29, 2009: "Bose-Einstein Condensation of Strontium"
In 1995, the combination of laser cooling with a subsequence stage of evaporative cooling led to the attainment of quantum degeneracy in bosonic alkali-metal gases [2,3]. These quantum gases, called “Bose-Einstein condensates” (BECs), have opened an extraordinary window for the exploration of the quantum world. To create a BEC, the phase-space density of the gas has to be increased beyond a critical value by lowering the temperature and increasing the density of the gas. Laser cooling was so far unable to reach quantum degeneracy because the photons used to cool the gas have negative side effects, which limit the achievable density and destroy a BEC. In our experiment we overcome these side effects and create a BEC of strontium by laser cooling . Furthermore, our method creates a BEC immersed in a laser cooled cloud of atoms, which opens a simple path towards the construction of a truly continuous atom laser. Our scheme relies on the combination of three techniques, favored by the properties of strontium. The first technique is called “narrow line cooling”. Strontium possesses a narrow laser cooling transition of only 7 kHz width. Operating a magneto-optical trap (MOT) on this narrow line, we can cool a gas of strontium atoms down to temperatures of about 800 nK. This is already more than an order of magnitude colder than conventional MOTs of alkali atoms! The second technique is a separation of our cold gas into two spatial regions (see Fig. 1): one large region, in which about 10 million atoms are trapped in a “reservoir” optical dipole trap and continuously cooled by laser light, and a small region, in which about 1 million atoms are confined at a much higher density by a steep confining potential, often called a “dimple”. This is the region where the BEC will be created. Figure 1: Three absorption images of 10 million strontium atoms trapped in a dipole trap and cooled to about 800nK by laser light. All images are taken on the narrow cooling transition. The left image shows the reservoir of atoms, which is used to dissipate heat. For the central image, we have applied the transparency beam, such that atoms located within this beam cannot absorb photons from the cooling light. 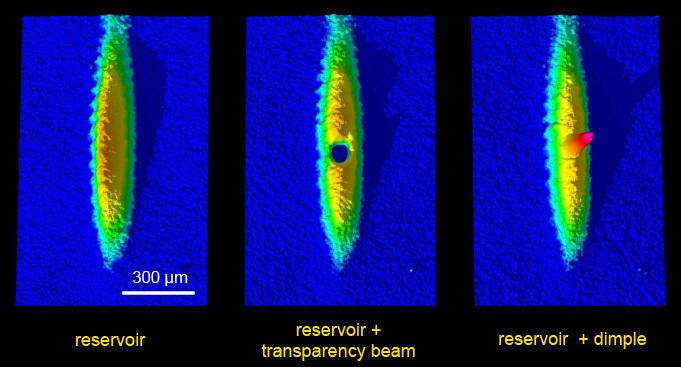 The density in this region is greatly enhanced by a dimple beam, as can be seen on the right image, where the transparency beam has been turned off. The third technique allows us to overcome the negative side effects of laser cooling photons in the dimple region. We protect atoms in this region from those photons by the help of an extra laser beam, which we call the “transparency beam”. This beam acts like a cap of invisibility, as it modifies the energy states of the atoms in the dimple region such that they cannot absorb laser cooling photons (see Fig. 1). Importantly, the atoms are not only transparent to the cooling laser beam, but also to laser cooling photons scattered towards the dimple region from atoms in the laser cooled reservoir. Now we have two different regions: the outside “reservoir” region, in which atoms are gently cooled by laser light and a central dimple region, in which the BEC will form. A connection between the two regions is established through the elastic scattering between atoms: in this way, heat can be transferred very rapidly (on timescales of a few 10 ms) from the dimple into the reservoir, where the heat is dissipated. To maximize this heat transfer, we place the dimple right into the center of the reservoir, as can be seen in Fig. 1. Once the system is prepared in this configuration, it takes only about 60 ms for a BEC to appear, and after a little over 100 ms, the BEC has reached its final size of about 100 000 atoms (see Fig. 2). 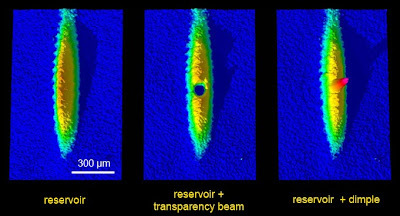 Figure 2: Absorption images, taken 24 ms after release from the trap. On the left image, the BEC is faintly visible as an elliptic density increase in the center. For the right image, we have removed all atoms from the reservoir just before the release from the trap, and the BEC stands out clearly. An important property of our system is that laser cooling constantly provides strong dissipation, removing entropy from the gas. Even if we destroy our BEC by local heating of the dimple region, it will quickly reform after the heating process is switched off, as long as enough atoms are contained in the dipole trap. We believe that our scheme can be adapted to other elements. We expect it to work with all species that possess a narrow cooling transition and have a reasonable scattering behavior. These criteria are fulfilled by a selection of elements, most prominently the lanthanides. The range of suitable candidates can be increased substantially by going one step further: sympathetic cooling between strontium and another element. This element would not need to feature a narrow cooling transition. Instead, it would be trapped in the dimple region and sympathetically cooled through collisions with the strontium atoms in the reservoir. We have recently implemented this sympathetic laser cooling scheme in a mixture of rubidium and strontium. The rubidium gas is cooled very efficiently by thermal contact with laser cooled strontium atoms, delivering ideal starting conditions for the creation of quantum degenerate Rb-Sr mixtures by evaporative cooling . By using a Rb specific dipole trap as a dimple, it should also be possible to create a Rb BEC without evaporative cooling. Our scheme also paves a relatively simple path towards a truly continuous atom laser. Here, a thermal source of atoms would be converted into a coherent beam of atoms, constantly outcoupled from the dimple region. The dimple would be continuously fed by the reservoir region, which in turn would be replenished by pre-cooled atoms from a MOT. Such truly continuous atom lasers are highly desired in various schemes of precision measurements. Proceedings of the International School of Physics "Enrico Fermi", Course CXVIII, Varenna, 9-19 July 1991, Laser Manipulation of Atoms and Ions, edited by E. Arimondo, W. D. Phillips, and F. Strumia (North Holland, Amsterdam, 1992). Physics 2000, BEC homepage. Link. Proceedings of the International School of Physics ‘‘Enrico Fermi’’, Course CXI, Varenna, 7-17 July 1998, Bose-Einstein Condensation in Atomic Gases, edited by M. Inguscio, S. Stringari, and C. E. Wieman (North Holland, Amsterdam, 1999). Simon Stellmer, Benjamin Pasquiou, Rudolf Grimm, and Florian Schreck, "Laser Cooling to Quantum Degeneracy", Physical Review Letters, 110, 263003 (2013). Abstract. Benjamin Pasquiou, Alex Bayerle, Slava M. Tzanova, Simon Stellmer, Jacek Szczepkowski, Mark Parigger, Rudolf Grimm, and Florian Schreck, "Quantum degenerate mixtures of strontium and rubidium atoms", Physical Review A, 88, 023601 (2013). Abstract.